The Safety Pin – It was embedded an inch into the hoof and left a bruise after Bud Delp pulled it out. Delp had thought about “scratching” Bid from the running of the Belmont depending on how he looked the day of the race. There were no signs of any distress pre-race or even post-race. He looked perfectly sound the next day also. Bud said later that during the race bid wasn’t shifting his weight to opposite sides of his body due to the injury. He also said years later he wished he had not mentioned the safety pin to Ronnie because he thinks it caused Ronnie to push Bid too soon. —The Horse – Horses like Bid have won 2/3rds of the triple crown and then lost the Belmont Stakes. Maybe the distance of a mile and one half was too much for him that day; due to the “safety pine” incident? Maybe due to the rough riding campaign he just didn’t have enough left to run on that day; due to the “safety pin”? So many people did not even consider the possibility that Bid may not have been 100% that day and not had what he needed to finish first. Maybe it was the horse? Or a combination of things that just did not fall into place that day? —The Jockey – It is amazing how often the jockey gets blamed when a front running horse gets bet. In past rides Ronnie was criticized for losing too much ground, so he got into good position without losing much ground. He took the lead early which seemed logically sound for the Belmont Stakes. Ronnie has said he may have pushed Bid too soon that day, but even so, shouldn't a great horse have been able to take on the challenge and still pull it out and win it in the end? That day even a great horse just didn’t have what it took to win. —The Fight – Angel vs. Ronnie - I won’t make any comment except to say much was written about the famous fight and the fallout from the fight some say it too had an impact on the outcome of the Belmont Stakes. The End Result…is the same there were a lot of unhappy, disappointed, and frustrated people that day at the track, but that is what makes horseracing exciting and keeps us coming back again and again. My Two Cents - So, please stop blaming ONLY the jockey. I am tired of reading articles blaming Ronnie for the loss, he was not out on the track alone, there was also a horse out there too and many other added factors that were in play that day. He couldn’t win the race without the horse. 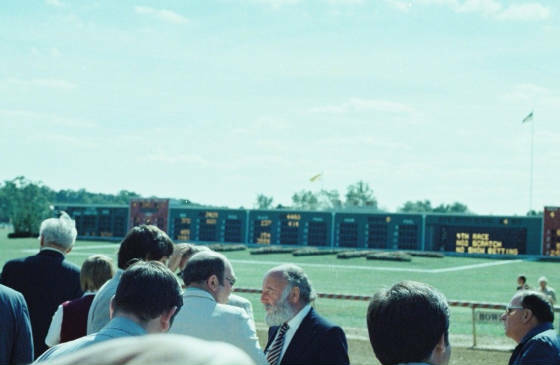 Can we just say on Saturday, June 9, 1979 during the Belmont Stakes everything just wasn’t in sync and leave it at that and let the Belmont Stakes of 1979 rest in peace?